Rs. 490.58 crore out of which Government of India’s share is 74.71 % and 25.29 % is held by financial institutions & others. The company has a Vision i.e. “to be a leading Indian company in fertilizers and beyond with commitment to all stakeholders” and a mission “to be a dynamic organization committed to serve the farming community and other customers to their satisfaction through timely supply of fertilizers and other products & services; continually striving to achieve the highest standards in quality, safety, ethics, professionalism, energy conservation with a concern for ecology and maximizing returns to stakeholders”. NFL has five gas based Ammonia-Urea plants viz. Nangal & Bathinda plants in Punjab, Panipat plant in Haryana and two plants at Vijaipur at District Guna, in Madhya Pradesh. The Panipat, Bathinda & Nangal plants were revamped for feed stock conversion from Fuel Oil to Natural Gas, an eco-friendly fuel during 2012-13 / 2013-14. Vijaipur plants of the company were also revamped for energy savings & capacity enhancement during 2012-13, thus increasing its total annual capacity from 20.66 LMT from 17.29 LMT, an increase of 20%. The company currently has a total annual installed capacity of 35.68 LMT (Re-assessed capacity of 32.31 LMT) & is the 2nd largest producer of Urea in the country with a share of about 16% of total Urea production in the country. Company has a Bio-Fertilizers Plant at Vijaipur with a capacity of 600 tonnes of solid & liquid Bio-Fertilizers to produce three strains of Bio-Fertilizers viz. PSB, Rhizobium and Azotobacter are produced. 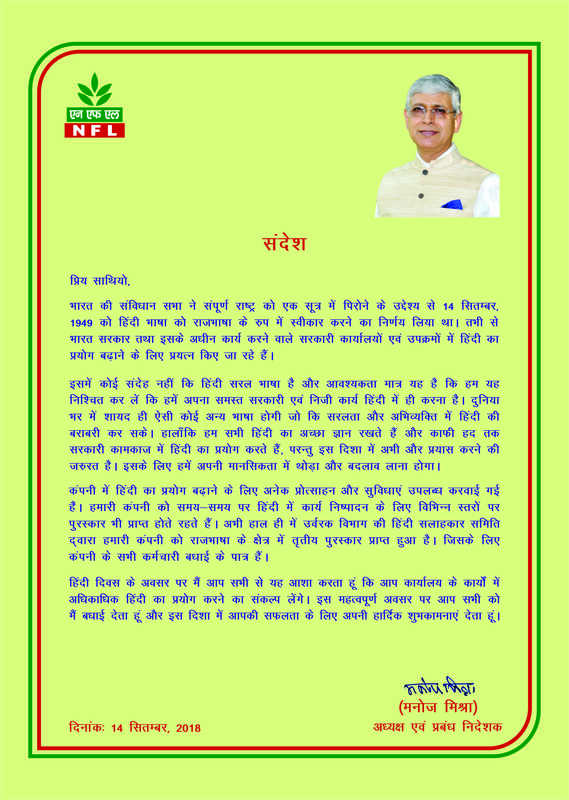 NFL is engaged in manufacturing and marketing of Neem Coated Urea, three strains of Bio-Fertilizers (solid & liquid) and other allied Industrial products like Ammonia, Nitric Acid, Ammonium Nitrate, Sodium Nitrite and Sodium Nitrate. The brand name of the company is popularly known in the market as ‘KISAN’. The company has also started production of certified seeds under its Seeds Multiplication Program for sale under its own brand name as Kisan Beej. Apart from manufacturing business, the company is also expanding its business, in a consistent & phased manner, by way of imports and trading of various agro-inputs like Non-Urea Fertilizers, certified seeds, Agrochemicals, Bentonite Sulphur, City compost through its existing PAN India dealer’s network under single window concept. NFL Marketing Network comprises of Central Marketing Office at NOIDA, three Zonal Offices at Bhopal, Lucknow & Chandigarh, 16 State & 2 UT Offices and 35 Area offices spread across the marketing territory of NFL. The company has 10 Soil testing laboratories (6 Static & 4 Mobile) with annual capacity of testing around 65000 samples for Macro Nutrients and 10000 samples for Micro Nutrients and are fully dedicated to the testing of soil health helping farmers to facilitate balanced fertilization. The company has a R&D set up at each Manufacturing Unit i.e. at Nangal, Panipat, Bathinda and Vijaipur as well as at Corporate Office (Noida) which are primarily focused and undertakes various innovation studies to develop new, efficient & safer processes, value added products and suggest implementation of energy saving schemes. The company has recently implemented various energy saving schemes such as Purge gas recovery plant at Vijaipur-II, hooking up of old redundant Ammonia Synthesis Converter (S-200) with New Converter (S-300) at Panipat & Bathinda Units and additional 2 nos. cooling tower cells in Urea Plant at Vijaipur-II. The company has also commissioned two roof top solar plants of 100 KW & 90 KW at Corporate Office, Noida and Bathinda Unit. Further, in order to meet the strict energy norms fixed by GoI under New Urea Policy 2015 w.e.f. 01-04-2018, though the investment is economically unviable without suitable dispensation as sought by NFL from GoI, the company is in the process of implementing energy saving schemes i.e. Installation of Gas Turbine Generator along with Heat Recovery Steam Generation Unit at Panipat, Bathinda & Nangal Units with an estimated cost of Rs. 700 crore. The company is also going to implement energy saving schemes at Vijaipur-I & II to further bring down the energy consumption. R&D initiative with M/s IARI, New Delhi to design & develop an applicator & logistic arrangement for application of Urea Ammonia Nitrate (UAN) which is envisaged to be manufactured at Nangal Unit. Construction of Natural draft prilling towers at Panipat & Bathinda Units to improve Urea prill size with estimated cost of Rs. 90 crore (Rs. 45 crore each for Panipat & Bathinda Unit). Di-Ammonium Phosphate (DAP) plant of 10 LMT per annum along with Phosphoric Acid Plant in Algeria under buy back arrangement & in Joint Venture mode with GSFC, RCF and NMDC. NFL in collaboration with M/s EIL and M/s FCIL has formed a Joint Venture (JV) Company as Ramagundam Fertilizers & Chemicals Limited (RFCL) to revive the old FCIL plant at Ramagundam. The equity participation in the joint venture is 26% each by NFL & EIL, 11% by FCIL and 11% by State Government of Telangana. This plant shall have the annual Urea capacity of 12.71 LMT. The zero date of the project is 25th September 2015 and is targeted to be completed by end of December 2018. The project is in progress. The company is also playing a pivotal role in extending various agricultural extension services such as educating the farmers on judicious use of fertilizers along with total know-how on improved and scientific methods of cultivation to improve soil productivity. The company is providing support to the farmers by undertaking soil analysis for Macro & Micro Nutrients through its static & mobile soil testing vans for balanced use of fertilizers. The company participates in various Krishi Melas organized by leading agriculture universities for direct & effective communication with farmers. Towards sustainable development, NFL has taken various initiatives in adopting best practices for environment management, energy conservation and social upliftment. Some of them include conversion of its three Fuel Oil based plants on natural gas which is a cleaner and greener fuel, switch over of 'oil support' on 'gas' in coal fired boilers, installation of 100 KW & 90 KW Solar Power Plant at Corporate Office and Bathinda unit. The company is also promoting use of LED lights at its Plants, Offices and Townships towards its attempt to reduce the carbon footprints. The Company is equally committed towards society by taking responsibility for the impact of their activities on customers, employees, shareholders, communities and the environment in all aspects of their operations. Besides focusing primarily on the areas like Children Education, Women Empowerment, Health and hygiene, etc., the company also aims to conserve the natural resources for their efficient and sustainable use. Company has taken initiatives in the area of water conservation by renovation and maintenance of old and degraded water bodies, construction of stop dams in the severe water deficient regions of Central India. Company is also adopting focused approach for introduction of Non-Conventional sources of energy by installing Solar Water heating systems, solar lights, solar lanterns etc. in the old age homes and in the remote and backward villages where electricity is the major problem. Total manpower of the company as on 31-03-2018 was 3430 against 4068 as on 01-04-2014.